Due to PING Internet Trading Policy we are unable to sell Ping Hardware on-line. For more information and to purchase this product please call your nearest store for more information. Offered in two PING Pistol grip options: PP60 (mid-size) and PP62 (over-size). Counter-balanced (CB60) is standard on Kinloch CB and Doon models. Ensures full face forgiveness and a soft feel for consistent ball speed performance. Varying depths and widths within face pattern normalize ball speed across the face to provide consistent distance control. High-energy Pebax elastomer compound behind the milled aluminum face provides a soft feel without slowing ball speed. 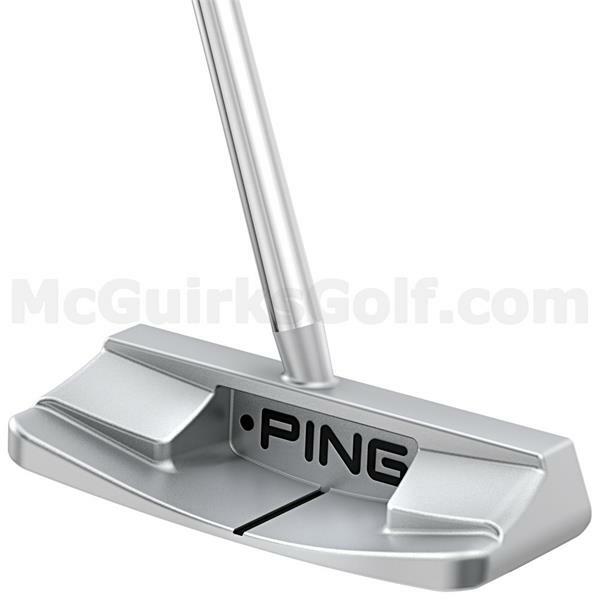 Putters are designed to fit one of three stroke types: Straight (3.5° or less closing angle on forward stroke), Slight Arc (3.5° - 7.5° closing angle) or Strong Arc (7.5° or more closing angle). Each putter is engineered into one of these categories based on its hosel position/style/length or shaft bend and general weighting characteristics which classifies the putter as face-balanced (Straight stroke type), mid-hang (Slight Arc) or toe-down (Strong Arc). Mallet-style heads in different shapes are larger to maximize perimeter weighting by positioning mass on the extremes. Varying alignment line lengths and locations are engineered to suit multiple visual preferences. Pistol shape fits naturally into the palm and fingertips for moreconsistent grip pressure. The lightweight mid- and over-sized grips provide a soft, tacky polymer construction to ensure a comfortable feel.